In the past i have told you in this way how my grandmother, who was a Cumanagoto Indian, told me every night some fantastic stories, which are part of the collective memory of Venezuelans. What I may not have shared with you is that while she combed my long black hair she liked to sing indigenous songs or often recited some poems. Of those poems, the ones that I remember the most, are those of the Cumanian poet Andrés Eloy Blanco, also those of the Spanish poet Antonio Machado. However, in my memory there are traces of a poetry that was sad, but that I did not understand and that she said were poems made by her people. Today I would like to tell you about Venezuelan indigenous poetry. Before moving on to the poems, I would like to tell you that according to some studies, it is believed that there are currently 26 different indigenous tribes in Venezuela: Akawayo, Añu, Arawak del Norte, Bari, Eñepa, Guajibo, Jodi, Kariña, Mapoyo, Pemon , Piaroa, Puinave, Pume, Saliva, Sape, Uruak, Warao, Wayuu, Yanomami, Yavarana, Yekuana, Yeral, Yurpa and South Arawak. There have also been many indigenous communities that have disappeared in the last two centuries, as many of them have adopted new customs and have moved to large cities. For example, the Cumanagoto community, of which my grandmother was, who adapted to the western social model and eventually lost not only their identity but also their territory. Of course, it is worth mentioning that there are some elements that remain intact of their culture, such as some foods and drinks, ornaments and musical instruments. What many have lost, perhaps as a result of the lack of interest of the ethnic groups themselves and the governments of the day, is the language, the language they used to communicate. Hence, I believe that any action to rescue part of the oral and written heritage of the natives, I find very important and invaluable. The stone that falls from the mountain runs fast. like the stone that runs off the mountain. strong is the snow of our páramos that resists the sun. o Like the snows of the Mountains. In this poem we can observe how the lyrical voice makes the comparison of man with nature, how the warrior must possess the virtues of what surrounds him. Nature is an example of strength, agility, fierceness, that is why men have to be like her in order to succeed, to succeed in the great battles. 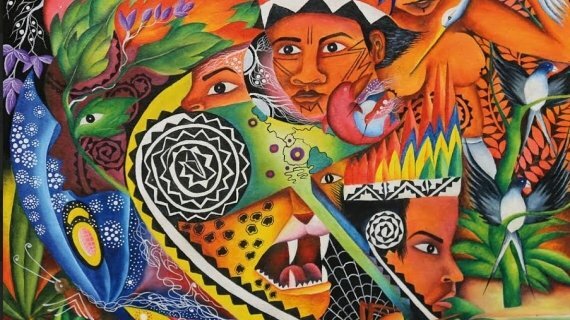 In indigenous literature in general, not only in Venezuelan literature, the tradition and the native cosmogonic richness of each of the ethnic groups is evident. It lets us glimpse the awareness that there is communion between man and nature. The tiger does not come. or he will eat you. One of the most common types of indigenous poems, are those that can work as lullabies. If we review the indigenous bibliography, there are many examples of poems that are children's songs, or at least they have all the air of the game, of the children's round. In this poem we see that the lyrical voice speaks of sleeping a brother, common activity in any family. In this poem we observe that the brother is asked to sleep or else a tiger will come and eat it. When reading this poem, I remembered my grandmother and her eternal ghost stories. The use of fear to control, to get them to do the right thing. I am a red butterfly. I am the dog that listens. and that the stones destroy. This poem, made from the enumeration and comparison, returns us the idea of communion between man and environment. The immediate reference of the indigenous man is nature, so it is her point of comparison, her image to metaphorize. The lyric voice speaks of how it feels when it is accepted by the beloved: beautiful natural images reflect the emotion, passion and joy that it feels; but in the end he also talks about how he feels when he is rejected: a boat empty and destroyed by nature. A soul is united to each one of us. But nobody can see it. The man who dreams that he dies does not wake up anymore. His soul has left him forever. But his soul is already very hurt. This beautiful poem expresses the idea that this ethnic group has of soul and death. The soul is something that we can not see, that always accompanies us, but there are moments when the soul leaves us: in the dream and when we get sick. 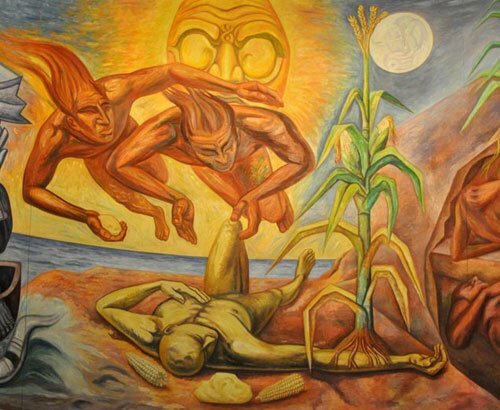 When man dreams that he dies, one way or another, he has begun to die, according to the Wayúu. Dreaming of death is related to illness, as if, in dreaming, we decreed death, we desired it. It is as if we were aware of it, only when we have little time left to live. When we begin to think about death, the soul flees, it goes away from us. When reading this type of text, we might think that they lack the poetic value of other poems we have read, that there is a certain simplicity and no creativity in their verses. However, I would like to rescue the value of the look proposed by these texts, a view so alien to ours; also its marked metaphorical sense affirming the own thing, the supernatural, magical, forces capable of explaining your universe. It would be interesting for indigenous youth to be interested in collecting the voice of the elderly, with the intention of rescuing the memory of the communities. Propose perhaps the dissemination and knowledge, within their indigenous communities and outside of them, about the importance of writing as a fundamental element to safeguard their history and wisdom. Perhaps in this way we can appreciate more texts like the previous ones and there are less possibilities for them to disappear as people. English: Yanomami of amazonas in puerto ayacucho I have seen them, also in Amazonas there are several indigenous communities, my mother was commissioned by a 10 years old girl to put her to study she is very intelligent and already learned Spanish her natural parents always come to visit her and Call her she's already more than 3 years old with my mom. An anecdote is that we brought her to Puerto la Cruz where there is a beach and she was frightened at first because she had only seen rivers. Her face was astonished. Dear @nancybriti, your post is a delight. And it sounds very close in your voice. I didn't know the poems you quote and they all seem beautiful to me, each in their own way: strength and grace for the warriors, persuation for the hungry child who doesn't want (and can't) sleep, tenderness for love, and the shadows of death. Preserving this cultural heritage is essential, especially after so many years of increasing this historical debt in our country for so many years. Thank you for sharing part of this inheritance (your close family inheritance), @nancybriti and @adsactly for publishing your text. The best thing about these poems is the musicality they possess when they are read aloud. A rhythm that sounds like a breeze, at a slow pace, like a big tree that gives shade. Thank you for having such enriching and encouraging comments, @adncabrera. Hugs for you too. A beautiful image, @nancybriti: this is how the shadow of a tree should look like. You make a very beautiful and necessary post, @nancybriti, because the literature of the autochthonous or aboriginal cultures of the American continent is very rich and deserves to be widely diffused. Particularly that of the ethnic groups that originally populated these lands that today are called Venezuela. Favorably, there have been dedicated researchers and compilers of that literature that was not written, but of oral tradition. You present us with a select and beautiful sample. and he felt happy and also shaken by doubt and mystery. dreams of food, fructifies and feeds. If God dreams of life, he is born and gives birth. God's dream appeared a big shining egg. a ruckus, because they were crazy to be born. They dreamed that in God's dream, joy was stronger than joy. I break this egg and the woman is born and the man is born. And together they will live and die. But they will be born again. They will be born and die again and be born again. And they will never cease to be born, for death is a lie. Reading your commentary and Galeano's text, I remember many indigenous myths about the creation of man, about how the earth was populated. Maybe it would be interesting to share them around here. Thank you for your kind and accurate comments, @josemalavem. Glad to see people interested in Latin American culture.